early at his job at the local UMART big-box store, showing dedication to his workplace. This is actually the K-Mart store at 1000 N. San Fernando Blvd, in Burbank, CA. Warner Bros, Disney and NBC Studios (and across the street from Burbank High School). the scenes where Larry pushes shopping carts and cleans up a children's ride. 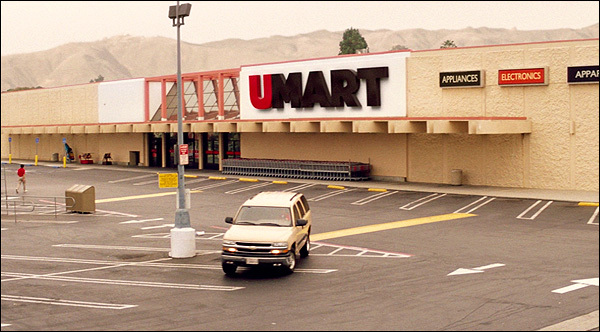 01:33: However, the UMART store's interiors, were shot a good 35 miles to the south. getting fired, were shot at another K-Mart, this one at 2900 N. Bellflower Blvd, in Long Beach, CA. That's in the Los Altos Gateway center, at Bellflower Blvd and Spring Street. 66:51: After Larry is fired from his beloved UMART, we see him driving home, in shock. This driving scene was shot on the 16500 block of Devonshire Street, in Granada Hills, CA. He is heading east on Devonshire, just east of Hayvenhurst, and we see him pass 16538 Devonshire. 07:05: He arrives home. His house is situated in a typical Valley suburb - appropriately enough, on a dead-end street. Larry's house is located at 8656 Balcom Ave, in Northridge, CA. and just south of Parthenia. The camera is looking west/northwest. The later shot, below, (from 41:07) gives us a wider look at his house and street. 08:22: Unemployed, Larry then goes out looking for a new job, in a montage of shots. He makes two quick stops. The first is a small hardware store located in a strip mall. of Mariposa & Lake. The camera is looking west/northwest as he walks beneath the awnings. Here's a matching Google StreetView for the strip mall. 08:35: While job-hunting, Larry also stops at a Rite-Aid drugstore, and the camera lingers on the sign. You'll find that particular Rite-Aid at, at 735 E. Altadena Drive, Altadena, CA. just a block north of that strip mall hardware store. behind the desk tells him that they can't do that, and suggests he start liquidating his assets. loan documents back to the woman, telling her he's walking away from the bad debt. at 3290 E Artesia Blvd, in Long Beach, CA. on the northern edge of Long Beach, on the border with Paramount, CA. 12:04: Trying to improve his chances, Larry goes to college: East Valley Community College. located at 1000 E. Victoria Street, in Carson, CA. First, we see the East Valley Community College sign. That is actually the C.S.U.D.H. sign, except, of course, they changed the name. You'll find that sign at the southeast corner of Victoria Street & Avalon Blvd. Here is a Google StreetView of that college sign - the way it looks in real life. when he spots two bikers at the station, spending almost nothing to refuel their bikes. It gives Larry the idea of buying a scooter (and selling his SUV), to economize. This scene was shot at a real Chevron station at 17011 Devonshire Street, Northridge, CA. That's at the northwest corner of Devonshire & Balboa Blvd. Here's a Google StreetView of the gas station. 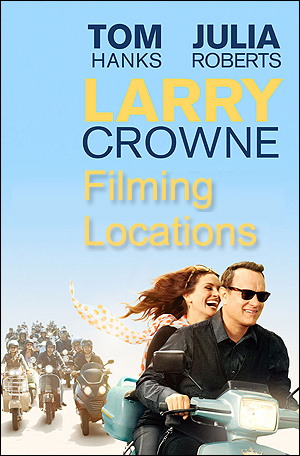 The photos on this page are stills from "Larry Crowne"